I discovered Dallas Moms Blog on Pinterest. Out of all of the fall wreathes that I scrolled through I was drawn to hers and her easy tutorial. The cool thing about this wreath is that it can change seasons/holidays without leaving your door. And the best part, at least for me, was to learn that she is a New Mexican girl living in Texas—Just.like.me! Here is what my wreath looked like with the Fall theme and the Christmas theme. I added Halloween decor and then pumpkins and fall decor for Thanksgiving (which are not shown). Let your imagination go with the possibilities. I replaced the orange burlap with red burlap and added some red and white berries to make it more festive. Hmmmm? What should I do for the spring? I cannot get my burlap loops to stay when just using one ring per color. The weaving method is easy, but what holds it from slipping out of the ring when not using the weaving method? Yeah, I know what you mean. 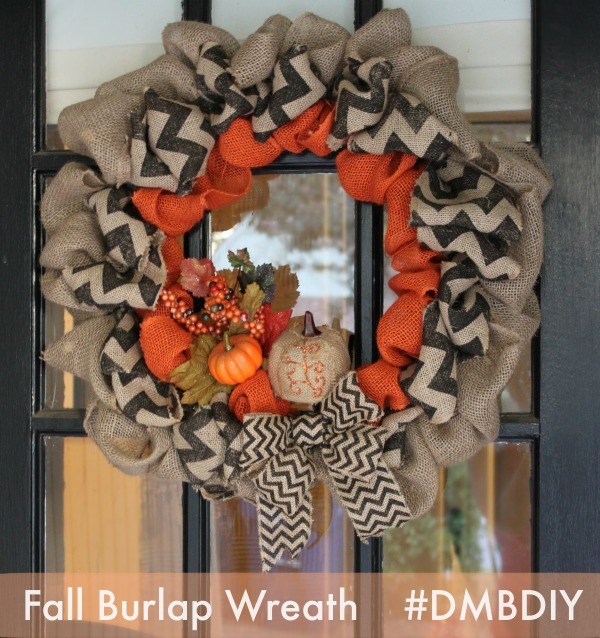 I liked her wreath and used it as inspiration but it does seem to be missing a step on securing the burlap. I have made a few more wreaths and have added wire to secure the ribbon in place. I tie it so that you can’t see the wire. I’ve also referred to another tutorial,that may help you as well. I will attach it below. This tutorial is burlap all the way through but you can still take the twist idea and secure it with wire on each ring. Thanks for your comment and stopping by my blog. Hope that helps you. Definitely a trial and error thing. But so much better than buying a store bought wreath…and cheaper.